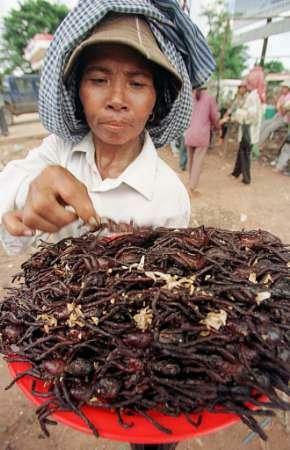 Post those nasty pics of people eating insects here. Slow Roasted Heterometrus Spinifer Scorpions. Due to involving from an amphibious ancestor they taste similar to a sea prawn with a slightly bitter taste. They can be enjoyed straight out of the can or served with a variety of dips and sauces. Blend first three ingredients. Add remaining ingredients and chill. Preheat oven to 375 deg F. In small bowl, combine flour, baking soda and salt; set aside. In large bowl, combine butter, sugar, brown sugar and vanilla; beat until creamy. Beat in eggs. Gradually add flour mixture and insects, mix well. Stir in chocolate chips. Drop by rounded measuring teaspoonfuls onto ungreased cookie sheet. Bake for 8-10 minutes. Stir boiling water into gelatin. Dissolve completely. Pour mixture slowly into 13 x 9 inch pan. Chill at least three hours. BLOX will be firm after one hour, but may be difficult to remove from pan. Cutting blox: dip bottom pan in warm water 15 seconds to loosen gelatin. Cut shapes with cookie cutters all the way through gelatin. Lift with index finger or metal spatula. If blox stick, dip pan again for a few seconds. Special Thai green curry, Tom Yum and Tom Kha with juicy high protien scorpions or Giant Silk Worms, great served with jasmine rice and washed down with a cold beer. Delicatley roasted small frogs with tasty and spicy seasoning. Delicatley roasted Big Fat hairy tarantula spiders tossed in a tasty and spicy seasoning. Delicatley roasted termite eggs in a tasty and spicy seasoning. Ants eggs are a popular additive to spicy salads and are also very tasty on toast! Preserved Hornet Grubs in salt water brine! Scientists have discovered that the Hornet bee and its grubs have astonishing powers to boost human stamina. Hornet bees have the energy to fly the equivalent of more than two marathons in search of food for their young. We have a variety of farm raised baked insects in special foil packets in flavours such as spicy Tom Yum, Issan Laab, Pad Grapow, Smokey BBQ ect. culinarily speaking, thai food is very good but some peoples of this country have the most terrible concept of what can be eaten; the isolated abo and african bushman I can condone his eating habits but can not do the same for our hosts with their disgusting crispy creepy crawlies in full view downtown Bkk! de gustibus non disputandum est ... yea right! You beat me to my next dinner thread. Excellent! I tried rice bugs once. You know those who look like big cockroaches. They are pretty expensive for such an ugly critter but they don't taste that well. 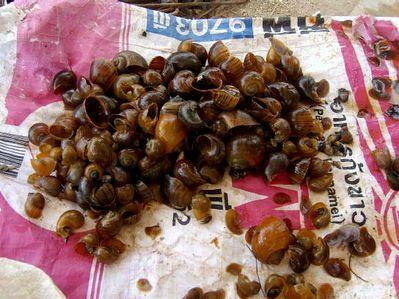 I suppose we should include snails in this as only Thais and the French eat them, I got to admit I have know idea how they cook these and I really don't feel like asking. 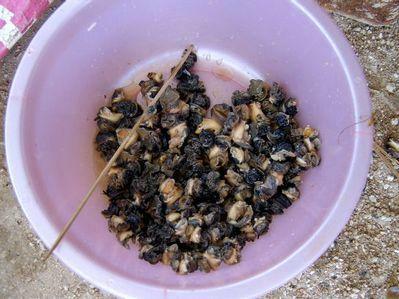 I have to admit I have eaten snails in Europa as well as in Thailand. The small ones in Thailand are not that delicious though. The big ones from France are much better. I think the Thais just boil them in water. 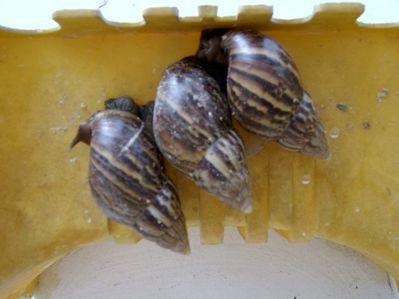 I really don't know how they catch these, I can't imagine they just go out looking for snails, anyway here is a picture of the unpicked snails. Hell once they are picked they just look like cockles to me, they use a tooth pick to get the beasties out of their little house. DD, I have to admit that I eat everything you post here except "spider"
Bargains galore on the net. But how many of them are in a can? How much are water bugs these days on the streets of Pattaya?